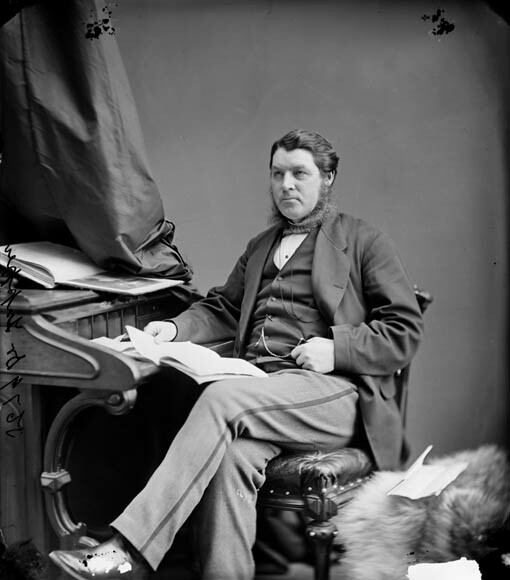 The longest-surviving Father of Confederation, Charles Tupper was leader of the Nova Scotia delegates at all three Confederation conferences. In the years following union, he held a number of high political offices, including that of High Commissioner to London. He also holds the dubious distinction of being Canada's shortest-serving prime minister. Charles Tupper was born in Amherst, Nova Scotia, the son of Charles Tupper and Miriam Lockhart. He studied at Horton Academy (now Acadia University) before going on to study medicine at the University of Edinburgh, becoming a doctor in 1843. Upon returning to Nova Scotia, he established his medical practice at Amherst. He began another practice at Halifax in 1859, also serving at the city and provincial hospitals. He was president of the Medical Society of Nova Scotia in 1863, and was the first president of the Canadian Medical Association from 1867 to 1870. Throughout his political career, he continued to cultivate his medical image, establishing practices at both Ottawa and Toronto, and keeping his medical bag beneath his seat in the House of Commons. He was married to Frances Morse on October 8, 1846. Tupper first ran for office as a Conservative in Nova Scotia in 1855, winning a hotly contested election in Cumberland County against Joseph Howe (although his own party fared less well). He worked hard to improve the party's fortunes, gradually taking over from James William Johnston as leader. His efforts were repaid with the collapse of the Liberal government in 1857. When the Conservatives took office, Tupper became provincial secretary, a position he held until 1860. During this time, he initiated discussions with New Brunswick and the Canadas regarding the Intercolonial Railway. After a brief period in opposition, the Conservatives were returned to power in 1863. Following another term as provincial secretary, Tupper took over the office of premier from Johnston on May 11, 1864. Tupper was by this time a supporter of British North American union, believing it would benefit Nova Scotia, and himself. He headed the delegations to the Charlottetown Conference and Québec Conference, and felt confident that there would be no trouble in passing the Québec Resolutions. When he did meet with opposition to the proposals, he was able to forestall a legislative vote until the last possible minute. He assured the people that he would attempt to obtain better financial terms for the province during the London Conference. With the passage of the British North America Act, Tupper entered federal politics. Because of regional representation concerns, he did not receive a cabinet post in the new Canadian government. He refused a position with the Intercolonial Railway Commission, as he wished to maintain his influence and credibility in Nova Scotia. He spoke frequently in the House of Commons on issues affecting his home province. In 1868, he was sent to London to counteract Joseph Howe's latest petition against Confederation. He was eventually able to win Howe over to the side of union with a promise of "better terms" for Nova Scotia. Tupper held a number of cabinet posts until November of 1873, when the Pacific Scandal caused the collapse of the government. While he himself was not implicated in the scandal, he staunchly defended those who were, and was one of the strongest opposition voices in the House of Commons. When the Conservatives returned to power in 1878, Tupper became minister of public works. This ministry was split in 1879, with Tupper taking over the ministry of railways and canals. It was while he was in charge of this ministry that Tupper oversaw the completion of the Canadian Pacific Railway (CPR); he also funded the expansion of the Welland Canal, and advocated expansion of many local railway lines. Controversy over construction of the CPR strained relations between John A. Macdonald and Tupper during this time, leading Tupper to accept an appointment as High Commissioner to London (at first unpaid; later, after May 1884, with a salary). He returned to Canada at Macdonald's request for the 1886 election, in part to combat the resurgence of Nova Scotia secessionism led by William Fielding. With the Conservative victory came a position as the minister of finance in 1887. In 1888, Tupper was made a baronet, and returned to his position as High Commissioner. As commissioner he was a vocal advocate for Canada, travelling the length of the British Isles promoting emigration to his home country, as well as Canada's commercial and agricultural interests. He gained increasing power at the highest levels of British society, taking an active role in international negotiations on behalf of both countries. Tupper's prominence in the Conservative party led many to regard him as the natural successor after Macdonald's death in 1891, but a variety of factors kept him from the post. It was not until 1896, when Mackenzie Bowell was forced to resign over the Manitoba Schools Question, that Tupper at last attained the party leadership, and the post of prime minister. However, the schools question also proved to be Tupper's undoing. He was forced to dissolve the government after just ten weeks, and the Conservative party was defeated in the election held later that year. While in opposition, Tupper worked hard to rebuild the party. He also tried to use the Boer War issue to undermine the Liberal government, to no avail. After the Conservative defeat in the election of 1900, Tupper resigned as leader. Tupper's remaining years were spent at Bexleyheath, England at the home of his married daughter, with frequent trips back to Canada to visit his sons. He was appointed to the British Privy Council in 1907, and also served on the committee of the British Empire League. His wife's death in 1912 was a severe blow, and he outlived her by only three years. Buckner, Phillip. "Tupper, Sir Charles". Dictionary of Canadian biography. Ed. Ramsay Cook. Toronto : University of Toronto Press, 1998. Vol. 14, p. 1014-1023. Farr, D. M. L. "Tupper, Sir Charles". Canadian encyclopedia year 2000 edition. Ed. James H. Marsh. 3rd print ed. Toronto : McClelland & Stewart, 1999. P. 2396. "Tupper, Sir Charles". Macmillan dictionary of Canadian biography. Ed. W. Stewart Wallace. 4th ed. Toronto : Macmillan of Canada, 1978. P. 842.